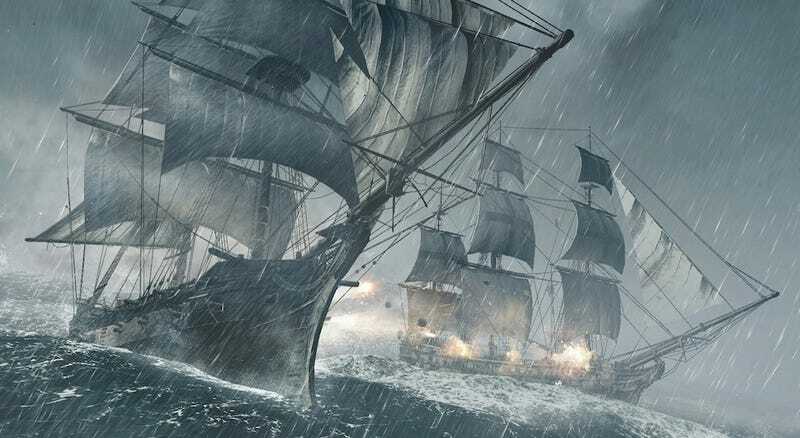 Maybe you spent the last weekend playing Assassin's Creed IV: Black Flag. Maybe you recently picked got the game for a next-gen console, or for PC. Or maybe Thanksgiving weekend finally provided enough downtime to really dig in. Here are a couple of things you might not know how to do. Yes, I've already written a tips post for this game. (It's below, actually.) I've also written a bonus tip on how to remove some of the UI clutter and make the game more immersive. But after playing a surprising amount of ACIV on PS4 this past weekend, I noticed two more things that I realized everyone miiiight not know how to do, and I thought I'd share them. Your "Heavy Shot" is super powerful, but you have to use it. Mortars are very useful in combat, particularly when softening up a large fleet or taking on a fort. But the Jackdaw has one more weapon available from very early in the game that can be devastating: Heavy shot. You know when you take on a powerful enemy ship and it fires those super deadly, flaming cannonballs at you? That's heavy shot. Unfortunately, the game does a lousy job of telling you how to use it. In fact, I played my entire PS3 run of the game without once using heavy shot. I'd see it in my inventory and think "Huh, I should really figure out how to use that," then never did. Every time I'd try to "change ammo" I'd use the d-pad, which would turn off the sea shanties. Who'd want to do that? Turns out, using heavy shot is almost too simple: You have to fire your cannons (right rigger) without aiming. So, you'll need to pull right up alongside your target, line it up by sight, then unleash hell. Your swivel-gun targets will light up, and you can clean out a third of a powerful ship's health right there. It's incredibly useful as the naval encounters get more challenging. You can loot abandoned floating ships, and it's pretty cool. Here's something else I didn't know you could do. Sometimes when sailing around, you'll see a smoking hulk of a ship that's been taken down by some computer-controlled enemy or another. You can't pull up alongside and initiate a boarding sequence, because you didn't damage the ship—you just found it. However, you can pull up nearby, dive off the Jackdaw and climb aboard. If you do, a timer will appear, and you'll have until it reaches zero to make your way around the burning wreckage, looting supplies from storage crates on the deck. It's neat, in an eerie way: The ship is silent, and the deck is strewn with dead men. As the timer hits zero, the ship will sink. Maybe you already knew how to do both of those things. But I'm betting that enough people out there didn't that it'd be worth sharing. Below, the rest of our tips for the game, for those just starting out.